This government is useless, my spouse did not wake me up in the morning, my boss does not understand what i am going through, my company should not have sold that business unit, the shopkeeper should have talked nicely, the movie could have been directed better, and on and on and on.....the blame game never ends, and we take it so casually, as an inherent part of our life. We even tend to ignore (at our own peril) what such a discussion (even if it is happening in our mind) is doing to us, and our own destiny is being shaped every moment. "Hows that possible? Someone has to take the blame for all the wrong that is happening around us? Someone must own it." These were my initial thoughts. But with time, i have realized that actually no one is to be blamed for whatever wrong you see happening around you. I also realized that i must question this thought process, the process where we are looking for someone to be blamed rather than focusing on how to move forward? Blaming anyone will not resolve the issue anyways. And this is what i have realized which causes this behavior of blaming others. Perhaps, we have been brought up in a culture that encourages the fact that we are the defacto standard of truth and righteousness while anything or anyone that we do not agree with, stands no chance and has to be trumped as a failure. We have come to believe that if anything wrong happens in life, we must put the blame on others, and we must come out utterly innocent. Let me give you a brief glimpse of how this attitude of blaming is developed since our childhood, and it all happens in such a subtle and unconscious manner that we do not even realize when it became our belief. Visualise what happened with you when you were a small child, when you just started to stand up with a support and took your first steps to walk alone. That was the time, when your mind was also getting developed, and creating belief systems of its own. You tried making your maiden attempt at walking without a support, and obviously you were unsuccessful and fell down. As soon as you fall down, you look around to see if anyone is watching. You may let this incident pass through, if no one is watching, but if someone has seen you falling, you shout out loud, expecting sympathy in return. You may not have a single genuine tear in your eye, but crying to gain sympathy at that moment is your birth right. And as the cry resonates in the house, probably the first person to come and pick you up was your mom. She would have picked you up and said something like this : "Ignore it, its not your fault. This floor looks faulty or the table is in the wrong place. Just be quiet,. It is none of your fault baby." Your mom may have gone even an extra step further and slapped the floor or the table to pacify you. That's it. This belief system development in us is so subtle. 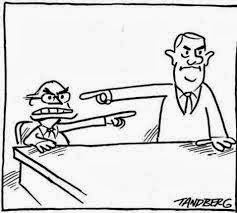 This is the time when the seed of blaming others gets into us ever so subtly. When this action happens repeatedly, it establishes a belief system in you that you are always right, and the blame for things going wrong is always with someone or something other than you. You were never comforted and given strength that falling is natural, that the table and floor are where they were anyways supposed to be, and that we must be more careful next time. As you grow up, when any unexpected, unwanted event happens in your life, you may not cry like you did when you were a child, but you might start shouting in anger, your voice pitch may go up, and you may start defending yourself as correct in whatever way you know best under the given situation. But remember this. There will be times in life when you will face tough situations and you would have no one to blame. And for sure there will be more than one of those. Will you be up to the challenge to face that adversity? You never built that courage and resilience within you to accept the blame on your own self. And if you break under this external pressure situation, if you did not have the resilience to handle that pressure, the resulting stress will start taking its toll on you. Whatever has happened since your childhood cannot be changed overnight. But can definitely be influenced with practice. And if you are a parent, make sure that you develop this resilience in your children right from the beginning. Give them support, courage, asking them to try again, but don't blame the floor or the table. This will develop enough resilience in them to face challenging situations in life and lead a happier life, and trust me, there will never be a lack of such adverse situations in today's life. Stop blaming, start taking charge by starting to challenging your belief systems. Look inside, for the world will become a happier place with a better vision only. Read more about challenging your childhood beliefs and how your everyday happiness is linked to it.